Turtle's English to Hindi dictionary has over 20,000 English words and their meanings in Hindi. Good for home users, authors, and those who want to learn the Hindi language. Users can quickly search for words or select a word from a list of words for its meaning. 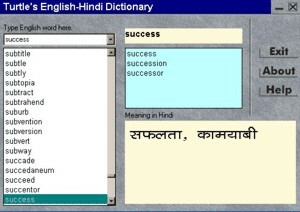 English To Hindi Dictionary has a quick and easy to use interface and full text search capability for English words. Most words have multiple meanings in Hindi. Qweas is providing links to English To Hindi Dictionary 2010 as a courtesy, and makes no representations regarding English To Hindi Dictionary or any other applications or any information related thereto. Any questions, complaints or claims regarding this application English To Hindi Dictionary 2010 must be directed to the appropriate software vendor. You may click the publisher link of English To Hindi Dictionary on the top of this page to get more details about the vendor.